It always happens when you’re unaware, and sometimes when you are actively seeking it – but it is not the same. 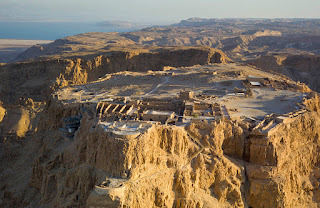 In 1975 on the mesa known in the Holy Land as Masada I had just left the people I was traveling with. We were guests of the Israeli government and had grown tired of our official guide. 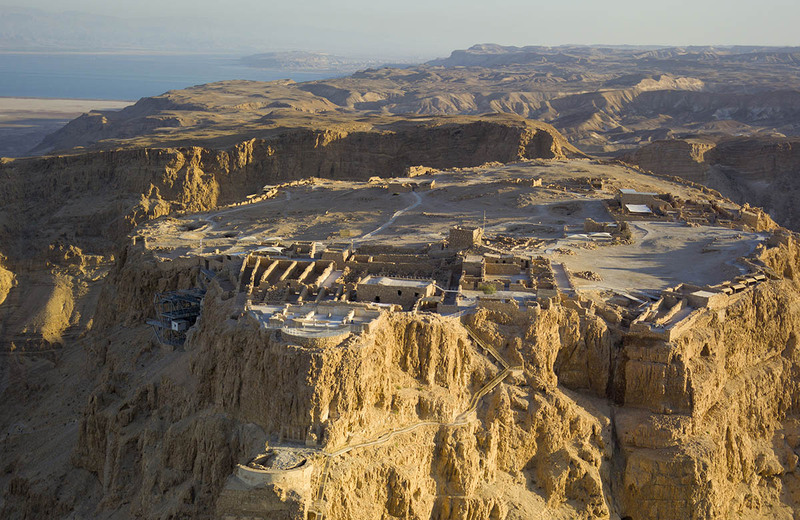 So, in an effort to still get something of our visit to Masada, we read Yigael Yadin’s account of the dig at Masada in order to be familiar with the site. At the end of our self-guided tour, we split up, and I wandered off to the south of the butte, discovering huge underground cisterns, and other structures. One of them happened to be a ruined Byzantine church, and as I entered, I was struck with two things. 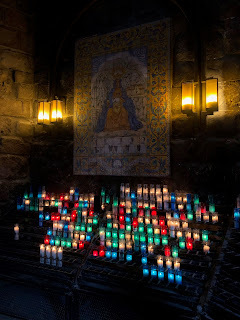 The first was a desire to pray, with an awareness of all the men (most likely) who had prayed here before me. The second was an innate sense of the holy. It just came upon me and it altered my experience of the place. 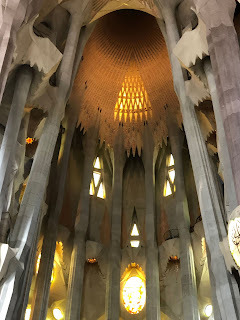 While in Barcelona we planned to go visit Sagrada Familia. We had both been there in 2004, and Arthur even earlier. I had it in my mind as sort of a sacred pilgrimage (religious? Aesthetic?). The provisions that obtain before making the visit make the idea of pilgrimage almost impossible: the ticketing, the electronics, the security measures, the sheer numbers of peoples, the mysanthrope. It was not exactly like finding a Byzantine Church in the desert as I hoped it would be. In a way it all ended up being a little underwhelming. I wondered what the intentions of the thousands of people who were with us were. There were glimpses of the holy however, and of the pilgrimages of others. Some were obvious and intentional. 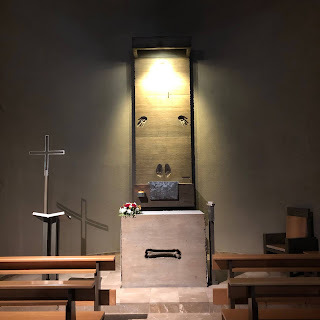 There is, of course, the chapel devoted to Eucharistic Reservation and Adoration. The one pictured above is not at Sagrada Familia. No pictures are allowed there, and I could find none on the internet. 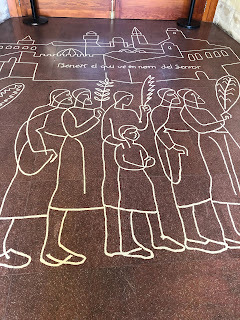 The one above is from the Basilica at Montserrat and displays some of the same sensibilities. There is utter focus at Sagrada Familia. There is no extraneous sculpture or stained glass – just the plain, stainless steel face of the Tabernacle. 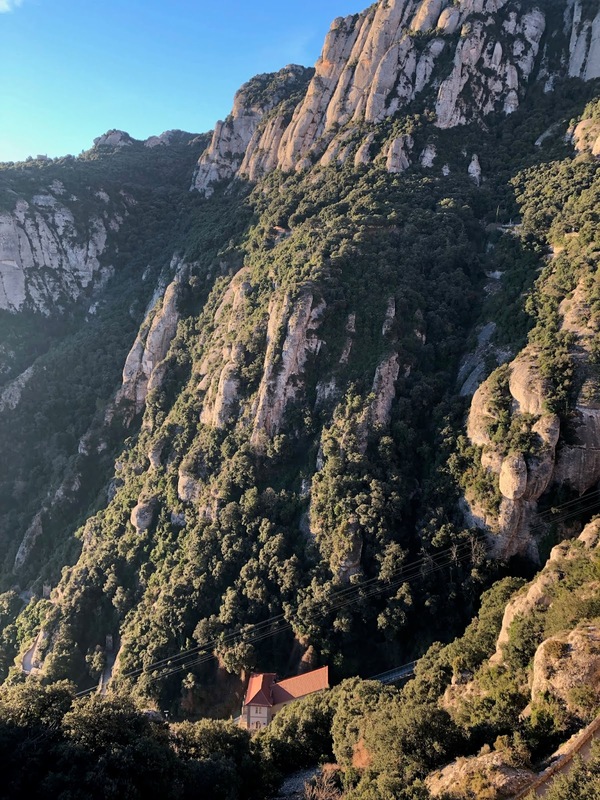 Here and at Montserrat there is an intended holiness and it works. 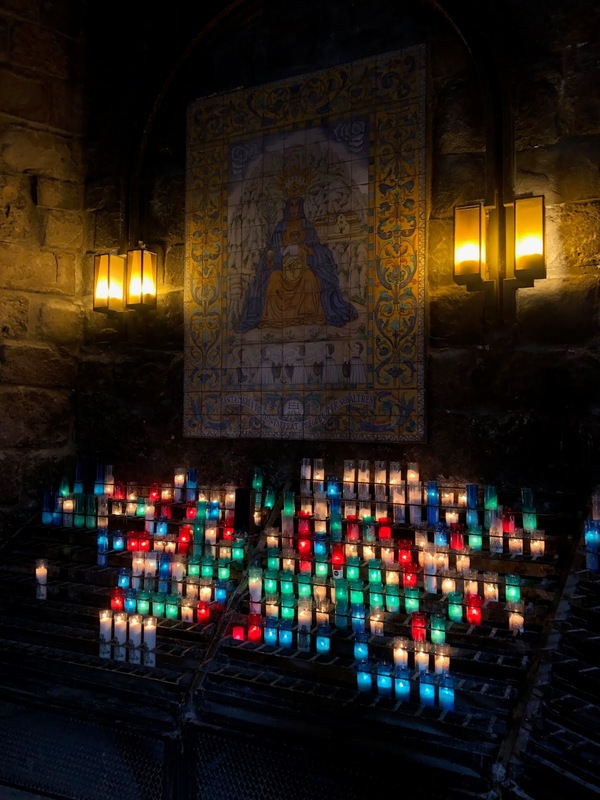 There is an indication of something else in the Tabernacle at Montserrat. 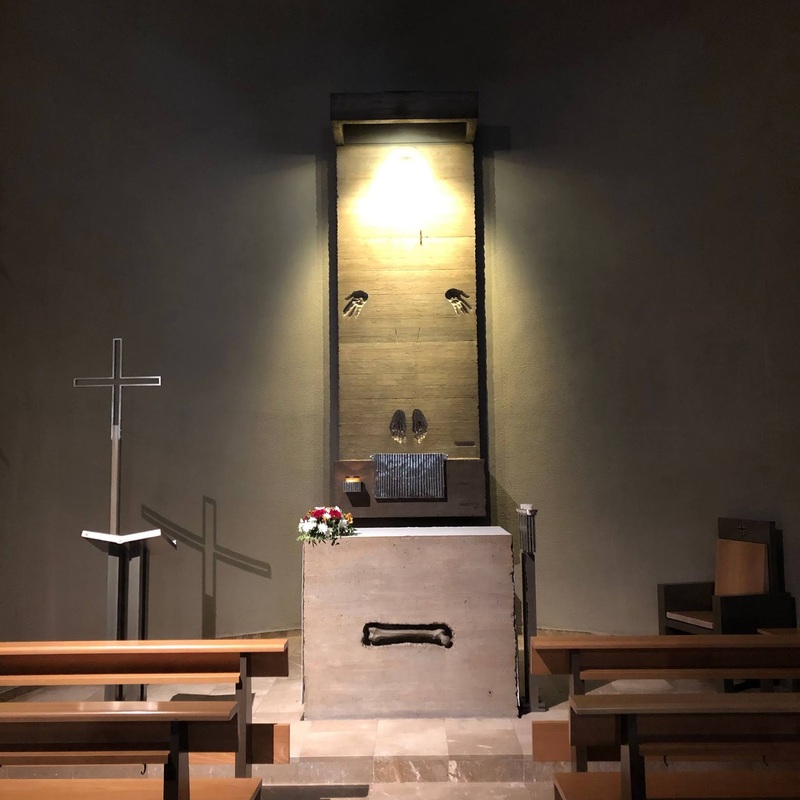 Unfortunately, the face of Jesus in the “reredos” is obliterated by the light, but then there are the hands, and the feet – touch. The notion and holiness of touch would be something that would stand out in both places. 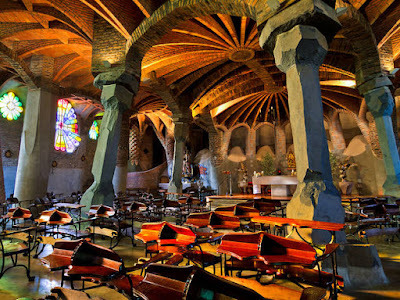 Gaudi was influenced by the forest in which he grew up, and his temples and churches, and even his housing are crowded with the examples of forest and mountain – the presence of nature. The chapel/crypt at Colonia is an excellent example of this where the supporting pillars are either outcropping of stone, or figurative tree trunks. 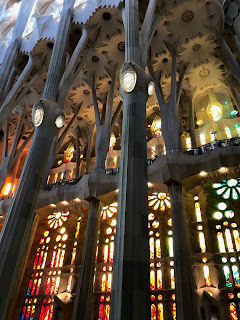 At Sagrada Familia the touch of nature is exaggerated by another touch – the touch of human beings. 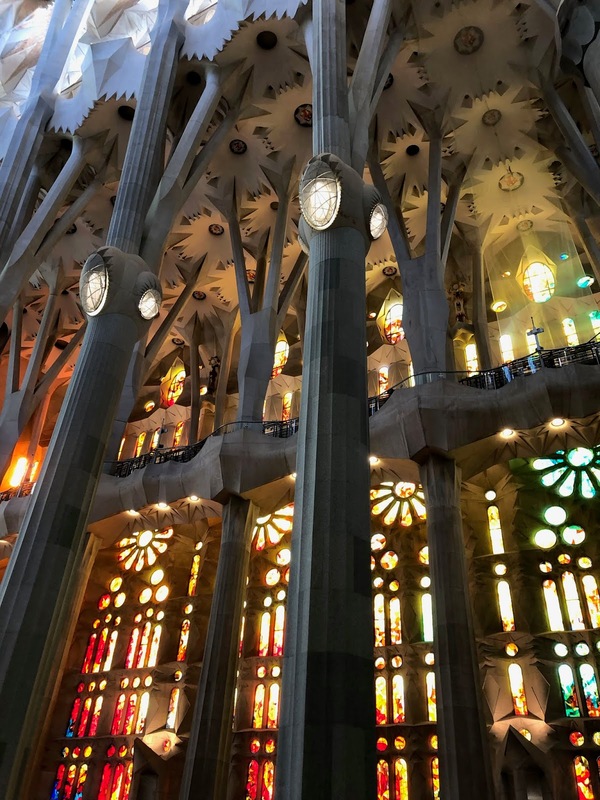 The large columns of Sagrada Familia are “stained” at shoulder height by the oils of the human hands who have reached out to touch these gigantic artificial trees. They are, I think, an attempt by some to touch holiness of place, beauty, or awe. I saw it at Montserrat as well. After I left the basilica and checked my pictures, I noticed that the photograph I had taken of the Black Madonna had been photo-bombed by the man in front of me. 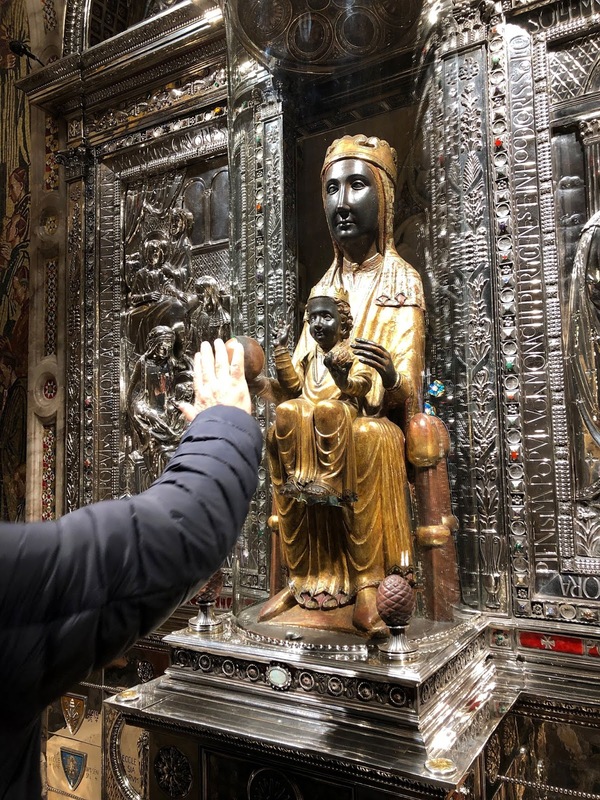 He had reached out, as is the tradition, to touch the orb of the Virgin, and to pray. It was a happy coincidence – that intrusion of touch and prayer. But there are other intrusions as well. 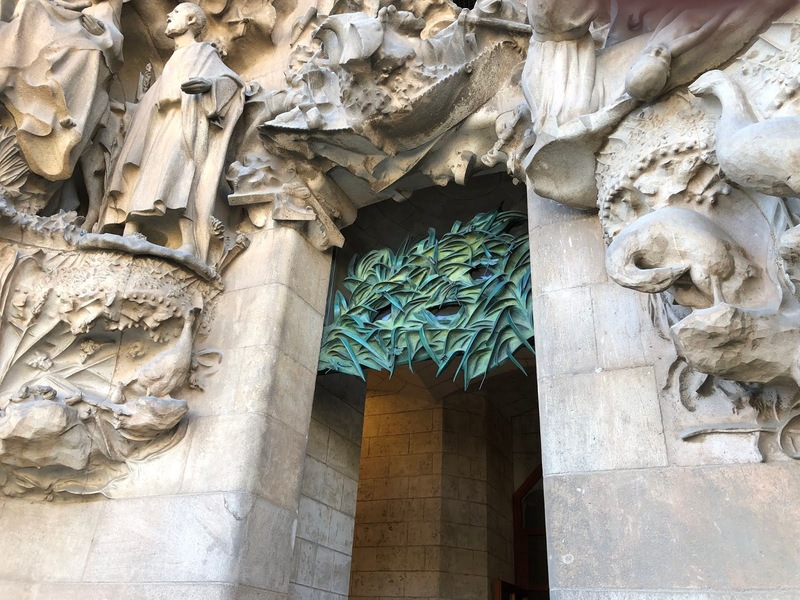 On the Nativity Façade one notices the great doors which are covered with leaves from the Tree of Life that towers above it. Even on the sides, however, the forest (nature) intrudes with its own holiness and witness, as leaves leap from once side of the portal to the other. 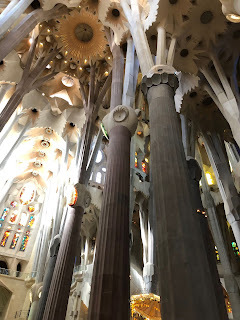 The sheer busyness of the stone work is but a quotation from the mountains that surround Barcelona. This connection of nature and faith is so evident in Gaudi’s art, and it makes me want to see the holiness of the world in which I live as well. I need to make an effort to find it. I am always moved by the symbolic as well. 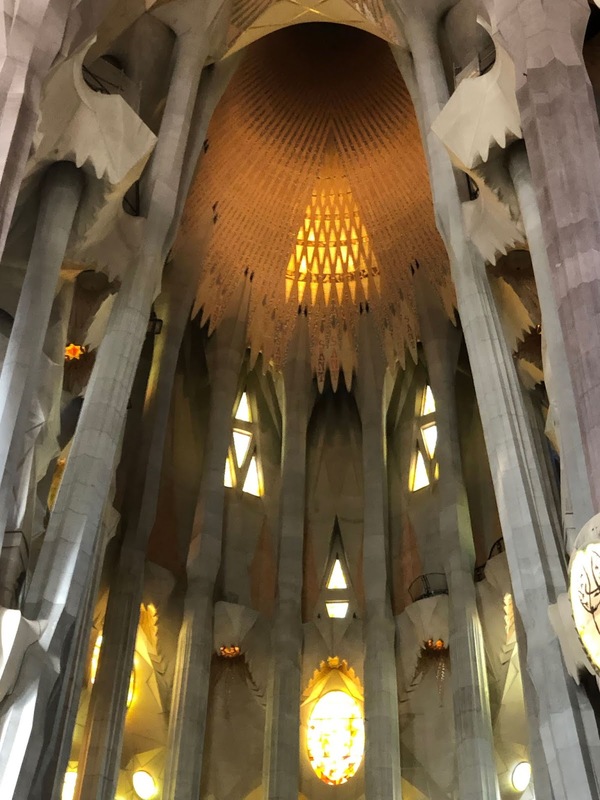 Hovering high in the apse over the altar at Sagrada Familia is a series of gilded triangles. Is this sign of the Trinity, said with a sense of simplicity and ineffability? I wonder. Or are they tongues of flame? For many, the sense of the presence and of their own need is said in light and fire. 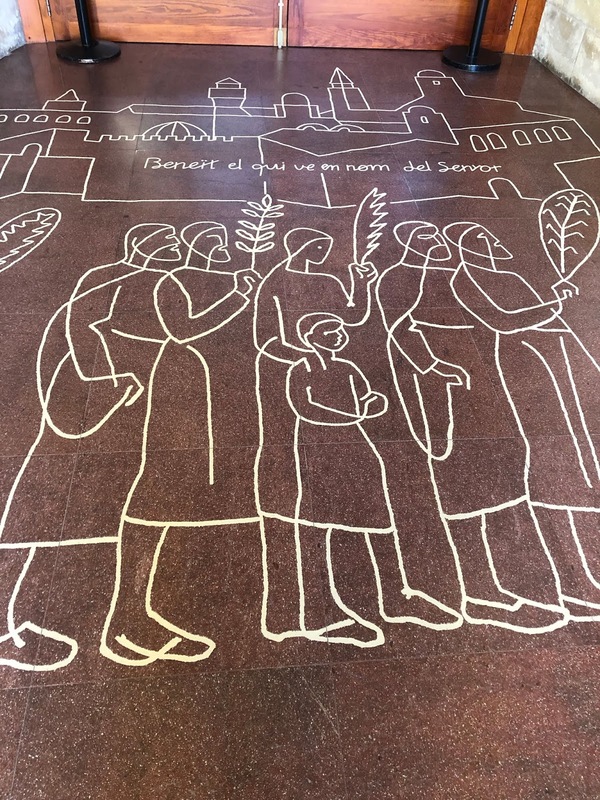 In wandering down from the Black Madonna, I found evidence of prayer, need, and answer. Here was holiness writ in fire.